Shane has spent the last week and a half picking berries in our neighborhood. We are surrounded by loads of boulevard woods that have berry patches. On his daily walk, he picked wild raspberries and blackberries and determined to make a pie from scratch with them. So he carefully laid them on a baking sheet in the freezer as he collected them, and yesterday it was finally time to make the pie. Oh. My. Goodness. I seriously don't know where this kid gets his cooking and baking skills. (Maybe all the restaurants he's served at...) I am a pretty good cook, but Shane has a passion for it and loves to make good food. I have NEVER made crust that looks like this, and I have NEVER made a pie that tastes this good. Jerry was in heaven as he is a huge pie lover. As long as the ScrapFIT challenge is "home sweet home," I thought I would share what Shane contributes to this home of ours! How wonderful! It's these simple pleasures that remind us how blessed we are. 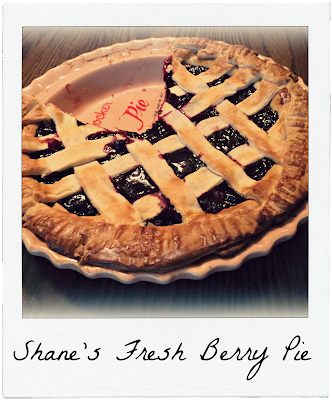 On a lighter but serious note: Shane should treat all of us with a pie crust tutorial!